All around the world people are experiencing the power, love and inspiration in simply gathering to be in Satsang together. 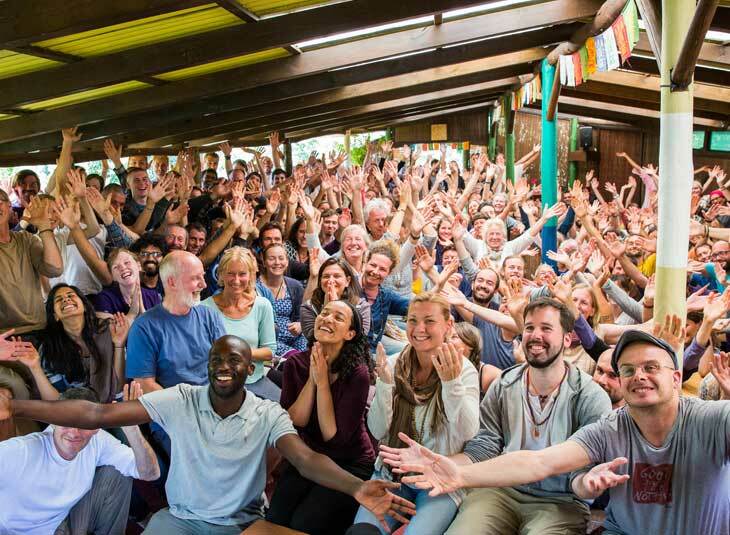 The Sangha groups are a wonderful opportunity to come together in your local area and to be immersed in Satsang with Mooji. Being together in a Sangha group creates a powerful contemplative and introspective vibration which allows one to follow and assimilate Moojibaba’s pointings more easily and deeply. Each one grows in such beautiful and profound ways. Hundreds of Sangha groups are gathering all over the world, blossoming in the spirit of Satsang and Truth, and Moojibaba offers his full love and blessings to all these groups. Whether you are sitting in Moojibaba’s physical presence or watching online, you are held in the same Satsang energy field. What is received directly from Satsang and from internalising the pointings is enough nourishment to flower in the Truth. There is no need to discuss or explain Moojibaba’s pointings further, and no one should be placed in a position of a teacher. If a burning question regarding the search for Truth remains unanswered, you can write to us here. The heartfelt intention of the Sangha groups is purely and auspiciously to offer a way to connect with others in your local area who are also called by Moojibaba’s pointings. Please be aware that the sangha groups have no legal or official affiliation with Mooji Foundation Ltd. or with any other Mooji organisations and do not represent Mooji in any official way. The following guidelines are offered to support and assist groups to come together in the spirit of Satsang. They have arisen through our own experience of how to move harmoniously as a Sangha and we very much advise you to follow them. However, they are not obligatory and if something different is working well for your group, you may continue with that. Naturally, just as each person is different, each Sangha group is unique in its expression but one in essence. If you have any questions, please contact the International Sangha team. We are happy to share these guidelines to support the many Sangha groups gathering all over the world. These guidelines, followed in the heart, are in full service and support to a Sangha maturing. We have seen and heard from so many about the power and incredible value of coming together to follow the pointings of Moojibaba and to sit together in a space infused with his presence. Sangha groups provide an auspicious opportunity to deepen in Truth—and there are also many beautiful surprises along the way! We encourage Sangha groups to move in outer and inner silence as much as possible before, during and after Satsang. This creates a highly supportive environment for Satsang and is in harmony with how Satsang is offered and received wherever Moojibaba is physically present. We recommend that those who come to the gathering are welcomed from the heart and given a few words of introduction about the video being shown. Everyone should find their own place to sit comfortably to enjoy the gathering. Sometimes, at the end of a session, it can be a beautiful opportunity just to sit in silence or silent contemplation, say for 10-15 minutes. You can close the session by ringing a bell. Avoid superficial socialising at Sangha gatherings. This means avoid engaging with others on personal or worldly matters which can become a distraction from discovering the pure presence. Focus on your own sense of being and remain as the Self or Isness, like this your presence may inspire others. In this way, we keep the vibration high and recognise that this is a sacred space where Truth is experienced and shared. Some groups have a more relaxed approach where the members interact between themselves more, while others find stricter silence better for the group. Either way, it is most important to pay attention to the inner environment of your group—that it is held in presence and harmony, and that there is an integrity and internal strength. In Sahaja everyone moves in a natural field of silence, and communicates from the ground of presence. It purifies and strengthens the atmosphere and climate in which we meet and it is still full of love. The program at Monte Sahaja and Satsang events varies and can include additional activities such as bhajans, chanting, aarti and laughing yoga, as well as displaying an element of devotional expression. Please know that it is not necessary to include these expressions within your Sangha group. Moojibaba’s teaching is complete in itself. Sometimes, these activities can flow naturally from the heart, and if this happens within your group, please be considerate towards the other members present, particularly any who are new. Care should be taken to explain the significance and meaning of each activity so that everyone understands and no one feels pressured. A note on Expressions of Gratitude: Many in the Sangha naturally feel a great love, respect and gratitude towards Moojibaba. Although some people show their love for him by touching his feet, particularly in the East, he does not encourage anyone to approach him in this manner. He prefers to be greeted with a polite ‘Hello’ or ‘Namaste’. Moojibaba likes when we are natural with him. Of course, we respect him and he wishes that we respect one another at all times. Following Moojibaba’s guidance and maturing in the recognition of our true nature is the greatest expression of our love and gratitude. Small groups are perfectly fine and there is no expectation or pressure to increase or limit the size of your gathering beyond what happens naturally and organically. Moojibaba generally welcomes everyone with an open heart. He enjoys, most of all, to meet beings who are hungry for Truth. He trusts that mostly these are the beings who will come and that you will recognise them naturally. It is beautiful when many members of the group come together to share the practical tasks and to set up the Satsang space as one Sangha. Those who offer their homes for watching Satsang should not be considered as group leaders, and different people in the group can also take turns hosting gatherings if this is the feeling. In this way the group shares the joy and responsibility of offering a space for Satsang. There should not be a hierarchy or any sense of ‘specialness’. If someone is nominated as the group contact, please know that this is for practical purposes. Remembering that Moojibaba is very open, flexible, intuitive and kind somehow guides us in every way. Those coming to watch Satsang must move with care and respect for the host and for the space offered. If you have opened your home for the group to come together and you feel uncomfortable about the behaviour of any visitor, you are not obliged to invite them again. If something within the group does not feel right or harmonious, the best approach is to address it directly within the group itself. It may take a little time for your Sangha to bond and become a strong, beautiful field of being, sharing from the heart with trust, wisdom, power and grace. Some patience is necessary. However, if there continues to be a strain without resolution, please contact the International Sangha team for guidance. If anyone wishes to engage in any of the above mentioned activities please ensure these happen outside of the group, its meetings, and any of its communication channels. 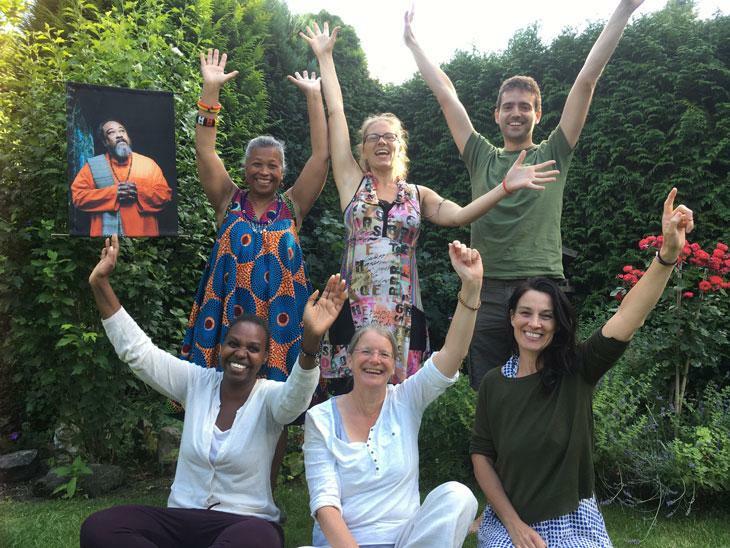 Naturally, expenses to come together can be shared amongst the group, however we ask that no donations are collected for or on behalf of Mooji Foundation. In case someone wishes to donate to Mooji Foundation, you can direct them here. Please be aware that the Sangha groups have no legal or official affiliation with Mooji Foundation Ltd or the other Mooji organisations and therefore do not represent Mooji in any official way. A powerful way to remain tuned in to the spirit of Sahaja and be connected with the most recent postings and spontaneous Satsangs is to subscribe to Sahaja Express. From time to time, the International Sangha team will also send information and tips, so please keep checking your email regularly. Moojibaba has a great love and care for each Sangha group and wishes to see them flourish through his guidance and radiate the light which emanates from the heart of Being. Listed below are the Sangha groups around the world that meet regularly to watch Satsang together. These groups keep the fire of Satsang alive in their towns. The Sangha groups are a wonderful opportunity to come together in your local area to be immersed in Satsang with Mooji. For any questions regarding the groups, or if your town or country is not listed, you can contact us here. Please be aware that the Sangha groups have no official or legal affiliation with Mooji Foundation Ltd. or the other Mooji organisations and therefore do not represent Mooji in any official way.